Ever wonder what it takes to become a pork rind expert? It takes someone who relishes each crunchy cracklin and who appreciates their crispy, meaty texture. Ultimately, it also takes someone with a pure love for fried pig skin. Here, we unlock some of the knowledge that all snacking experts know, including some need-to-know facts about the pork rind’s counterpart … the cracklin! Cracklins are the cousin to pork rinds, fried with just a little extra fat that gives them a major pork flavor. Also called scratchings, some cracklins are even fried a second time in order to give them that unmistakable crunch. One bite and you’ll wonder how so much flavor can be packed into such a compact snack! 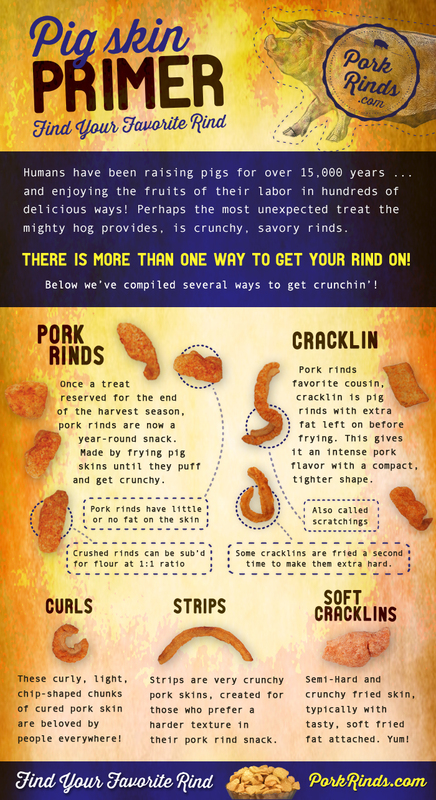 Check out our field guide to pork rinds (and cracklins) to know the in’s and out’s of your favorite snacks! With a crunch like Rudolph’s Pork Rinds, you’ll be able to tolerate even the … (shudder) vegetable medley your wife puts in front of you for dinner. We’ll get you through the month with a low-carb, high protein, and gluten-free snack that has the crunch and flavor you crave. The wife won’t nag you about your snacking habits when you tell her those pork rinds you’re munching on have more protein than nuts and are low carb. Nutrition is the backbone to becoming the man’s man you really want to be, so, during the month of June, skip the potato chips with 15 grams of carbs and reach for Rudolph’s Pork Rinds. We’re famous! Yes, for our signature pork rinds with supreme crunch and extraordinary flavor … but also for our exposure on national TV! 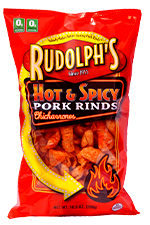 Rudolph’s Pork Rinds are a hot commodity and we’re serving up the very best. It’s no wonder fans want to know how we pack that much crunch into each rind. The Food Network featured our top-secret rind making process on Unwrapped 2.0 and now snackers everywhere are craving Mary Rudolph’s oh-so-top-secret recipe! And when the history buffs at the History Channel chose to feature us on Modern Marvels, we happily obliged. Now, you can get the inside scoop on the wondrous world of pork rinds! Crunch on! Are you ready for Eat What You Want Day? Even though we know you don’t need an excuse to “treat yo’self”, today’s the day to go all out. Take a crunchy bite out of life. On Eat What You Want Day, we’re devouring pork rinds by the handful. Men of the world, join us! Crunch on these rind recipes and you’ll be hooked! 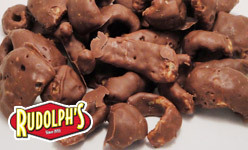 Rudolph’s Chocolate Covered Pork Rinds are a homerun. Crunch on them once and you’ll be hooked! So, the moral of the story? “Treat yo’self” to the best of the best today! Get ready to dip in to these salsas. They’re delicioso! Did you know that May 1st marks the first day of National Salsa Month? Oh, you did? Well, did you also remember that Cinco de Mayo is Tuesday? Or that pork rinds are the best way to celebrate for both? While some people might let Cinco de Mayo go unnoticed, we’re taking full advantage of it … And giving it the protein packed snack it deserves. We’ve got a few dips that we just know you’ll love snacking on while you’re down in your man cave. From a zesty guacamole dip that pairs perfectly with Rudolph’s Bold and Spicy BBQ Pork Rinds to our star of the month, tomato salsa that brings fresh Mexican flair to any of your favorite pork rind flavors. We dare you to take it up a notch and make this National Salsa Month as flavorful as possible! Crunchy Pork Rind Pigs in a Blanket. The competition on the baseball field is heating up and, while this spring weather has us shedding our jackets, National Pigs in a Blanket Day has us back in the kitchen covering back up (cocktail franks, that is!). We’re sure fans everywhere will agree that when you’re a pork rind lover you can’t get enough of pork. Whether you’re craving a game day snack or your dinner needs that special crunch, try this crispy Pork Rind Pigs in a Blanket recipe tonight. It’s a home run (ok, you knew we were going to say that). Make this pork rind recipe and share pictures with us on Facebook! Preheat the oven to 350 degrees F. Cut each triangle of crescent roll dough into thirds lengthwise, making 3 small strips from each roll. Brush the dough strips lightly with Dijon mustard. Put the mini hot dogs on 1 end of the dough and roll up. Arrange them, seam side down, on a greased cookie sheet. Brush with egg wash and sprinkle with crushed pork rinds. Bake until golden brown, about 12 to 15 minutes. Serve with additional warmed Dijon mustard and enjoy! Happy National Grilled Cheese Month! This delicious treat has more to it than you might think. No rind-lovin’ man is gonna settle for a dainty tea sandwich! Who says you have to stop at one slice of American cheese? Why even bother using the traditional frying pan? It’s time we take a stand … for a stand out food and its crunchy pork rind sidekick! Check out our grilled cheese sammy that’s a not-so-lean, mean, appetite hunger-crushing machine! 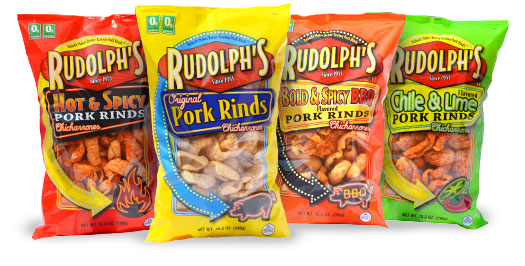 Rudolph’s Pork Rinds invite every rind-lovin’ man to challenge the ordinary. Here’s one grilled cheese recipe that donut and pork rind lovers everywhere will melt for! Fire up the grill! Use a bread knife to cut your donut in half lengthwise, creating two slices. Flip them inside out and lay them sliced side up on a plate. Spread both pieces with softened butter. Build your sandwich by placing one slice of donut, butter side down, on your hot grill. Layer cheese, pork rinds, and the remaining donut half. Cook until browned and cheese is melted. Happy National Nutrition Month! If you’re a passionate pork rind lover, we’ve got the facts and figures to make you feel even better about indulging in your favorite snack. All Rudolph’s Pork Rinds fans know that these crispy bites of goodness are maxed out in protein. With 17 grams in each serving, they’re a great way to end a work out and repair muscles, cartilage, and tissues. But did you know that pork rinds, by nature, are also rich in gelatin? Gelatin, an animal protein, is high in glycine, which promotes sleep, helps to ease joint pain, and contains easy to digest calcium that can help support healthy bones. This month, if you’re looking for a way to splurge at dinner time without ruining a day of healthy eating, give Lorrie’s Famous Pork Rind Salmon Cakes a taste. Combine the benefits found in pork rinds with the heart-healthy omega-3 fatty acids found in salmon and you’ve got yourself a powerhouse meal! February is National Snack Food Month! And yes, you got it … we’re ALL about that! We’re going to take full advantage each day by celebrating all of the pork rind snacking benefits! Pork rinds. All day. Breakfast, snack, lunch, snack, dinner, snack. Did you know that pork rinds are paleo-friendly? That’s right, eating like a caveman has never been easier. Each salty, crisp bite of rind heaven is packed full of protein. 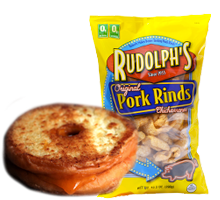 Rudolph’s Pork skins have zero carbs, giving them a low glycemic index, and only 5g of fat per serving, over half of that fat is “good fat”. You’ll never be satisfied with that greasy bag of potato chips again. Whether you’re craving Rudolph’s Original Flavored Pork Rinds, zesty Hot & Spicy flavor, or even whipping up Rudolph’s Chicharrones Quesadillas for the next basketball game, there’s always a snack celebration to make your February epic!